In the 19th and early 20th centuries, as realism came to the fore of theatrical culture, opera composers were quick to follow suit. Composers sensitive to the new style created “Opera Verismo” (“true opera”) telling real stories of real people, sometimes sordid and tragic (think of “Carmen”), sometimes noble and tragic (think of “La Boheme.”) But before either, came two great masterpieces by Piero Mascagnai (“Cavalleria Rusticana”) and Rugero Leoncavallo (“Pagliacci”) whose one-hit wonders have been thrilling countless enthusiastic audiences since their first performances. The two operas have a special place of honor in the history of the San Francisco Opera; they were performed as a double bill during the very first season at the War Memorial Opera House in 1932. Few characters in world theatre could be more beloved than the tragic clown, Canio, (the title character of “Pagliacci”) who, performing with a travelling theatrical troupe, kills his beloved wife in a jealous rage, in front of a small town audience. The universal popularity of the character is no doubt due, in large part, to the great Caruso’s recording of the aria, “Vesti la Giubba (Put on the Mask),” the most successful operatic recording in history. Given such a history, it is disappointing to report that the operas do not fare well in the current revivals, although “Cavalleria Rusticana” is in better condition than “Pagliacci” due to the wonderful work of the SF Opera chorus, directed by Ian Robertson. “Cavalleria Rusticana’s” entire first half is a choral masterpiece, and its performance is the highlight of these revivals. Beyond that, “Cavalleria” is capably performed in a straightforward manner, with some fine work by a great star, Ekaterina Semenchuk, as Santuzza. She delivers a performance that transcends the production. 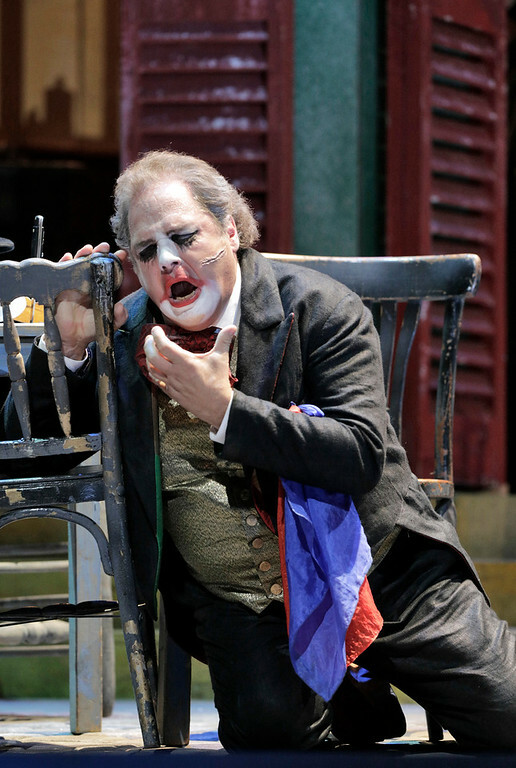 Alas, “Pagliacci” is, overall, below the standards we expect from the San Francisco Opera. This is a somewhat tired revival, capable throughout, but never transcendent. It is as if the director were working from a check list: Quaint town: check. Clever circus performers: check. Colorful costumes: check. An ample sprinkling of kitsch: check. Arias performed adequately: check. But the heart of “Pagliacci” is a great clown with a great overgrown heart, and, in this production that heart does seems to hold little more than a thimble full of emotion, instead of the swelling oceanic feeling the part calls for. Marco Berti is a fine performer with a large voice and impressive technique, but he is not the actor for “Pagliacci.” The finest production values and most careful virtuosity cannot save a Pagliacci that has lost it’s soul. Cavalleria Rusticana + I Paglicacci continue at the War Memorial Opera House through September 30. For further information, click here. “Cavalleria Rusticana” by Plato Mascagni with libretto by Guido Menasci and Giovanni Targoni-Tozzetti + “Paglicacci” by Ruggero Leoncavallo. Originally produced by Opéra Royal de Wallonie-Liège. Revival produced by San Francisco Opera. Conductor: Daniele Callegari. Revival Director: Jose Maria Condemi. Set Designer: José Cura. Costume Designer: Fernand Ruiz. Original Lighting Deigner: Olivier Wéry. Revival Lighting Designer: Justin Partier. Chorus Direcdtor: Ian Robertson. Choreographer: Lawrence Pech. Fight Director: Dave Maier. Mascagni: David Whatley. Arguing Couple: Buffy Baggot, Alan Cochran. Turiddu: Robert Aronica. Lola: Laura Krumm. Santuzza: Ekaterina Semenchuk. Mamma Lucia: Jill Grove. Alfio: Dimitri Platanias. Solo Dancers: Alexandra FitzGibbon, Jekyns Peláez. Leoncavallo/Tonio: Dimitri Platanias. Paperboy: Sebastian Vera Cuevas. Canio: Marco Berti. Nedda: Lianna Haroutounian. Beppe: Amitai Pati. Citizen: William O’Neill. Mayor: Chester Pidduck. Silvio David Pershall.